Resource tracking in Fieldlens allows teams to easily track and report on manpower, equipment and other jobsite resources. This can be done for the current day or backdated to account for an earlier date. Simply enter resource tracking data by adding it to a post using the web or mobile app. Resource tracking includes the ability to track the number of people onsite for a particular company or trade discipline. 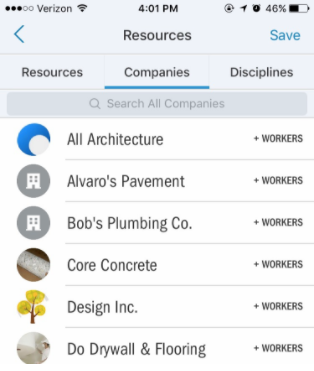 Companies that have been added to the directory will automatically be available for this feature when adding resource tracking to a post. If a company isn’t in Fieldlens, no need to worry - you can still count it. Just select the discipline it falls under - carpentry contractor or equipment supplier, for example. 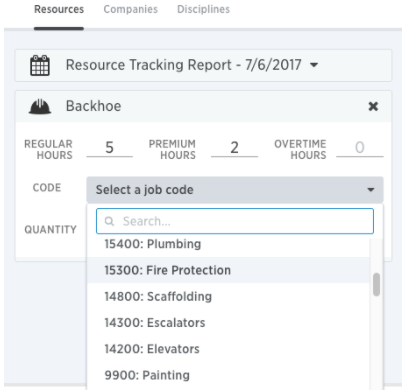 You can track the regular, premium and overtime hours of people on the job, or log hours for equipment or other resources. You can also capture the type of work a resource is performing using unit codes. For example, a carpenter might frame walls in the morning and perform finish work in the afternoon. You can select a unit code for each task performed. Fieldlens users from your company will be available for tracking hours automatically, but other people or resources can be added. These additional names of people, equipment or other resources, as well as your company unit codes, can be set up by your Company Administrator. They are set up at the company level - so setting them up once will apply them across all of your projects. Company Admins add unit codes or workers from the company profile page on the web app. Access the drop down menu in the upper-right corner by clicking your Profile Picture and select Settings. Click Company Settings at the top of the panel to see your Company Profile. From the left hand menu, tap on Resources and you’ll see buttons to +Add resource and +Add code. Once a new resource or unit code has been added it will be available to your users in the Resource Tracking section when creating a new post - and on all projects your company is on.